Reserve your 4G Pocket WiFi online here. Please call 680-587-9000 or 680-488-9000, or email to service@pnccpalau.com for more information. 4G Pocket WiFi devices currently available only at the Airport Kiosk, which is open during flight arrivals. 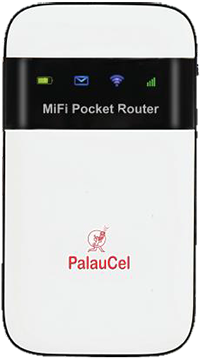 You can connect 4G Pocket WiFi to maximum 3 devices at the same time. 4G/3G network in Koror and Airai; 3G/2G in other states. Plan expires when data is used up or plan period ends, whichever comes first. Calling overseas from a Landline? check_circle Call from any landline in Palau. Calling overseas from a Mobile? check_circle Dial 587-9904 for info (7am-12am daily). Turn on your device's* wireless access, select PNCC WiFi Hotspot. *Using a WiFi 802.11 b/g enabled device. Wait for redirection to the login page. Log-in by entering your user ID and password. Minimize Logout page (don't close it).